From Nerd Reject to Over 40,000 Followers Online, How Did I Do It? 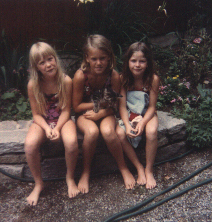 That’s me on the left, age 9, nerding out with my friends Sarah and Heidi of my earliest tribe. The more I look at my life the more I realize that attracting and maintaining my tribe has been a primary focus of mine since childhood. I was raised in a very preppy, conformist town on the East Coast and I never fit in. Often when I finally found a friend or two I liked, they’d move away. Or we’d change schools. Or they would just ditch me. This happened all the way into high school and college, and even afterward. When you’re an out-of-the-box creative weirdo with a rebellious nature and a highly visionary mind, finding your tribe can be a daunting, emotionally draining, and dis-heartening experience. That’s why I’ve spent decades (literally) figuring out ways to attract folks I’m truly aligned with, who are interesting to talk with, who really get me and I get them. I have especially focused on attracting the right, most divinely aligned clients to my business. I can hardly express how great it feels to meet total strangers who get me better than some of my own family members! And I get them. It’s a mutual love fest that happens through my marketing on an almost daily basis. I’m going to share all that in my upcoming webinar Attracting Your Soul Tribe Online, Wednesday, December 9, 2015 at 11 am PT. And I’m including the steps you can follow yourself to get out of isolation and attract the right people to your business or organization. When you’re running a business but attracting the wrong people, or not enough of the right people, you suffer. It’s a total drag. I’ve been there. And I’ve worked out a way you can market just by being yourself. Come along to my upcoming free training and we’ll explore how you can attract your true Soul Tribe online.